As I mentioned in my last post, I have the honor of speaking the the upcoming Propelle Style Summit with none other than Kiya Tomlin. Yes, she is that Mrs. Tomlin. She’ll be there speaking about her new clothing line. In addition to me and Kiya there will be lots of other fabulous ladies! Like my dear friend Mandy, who I’m hosting this ticket giveaway with. How can you get a free ticket? Comment on this post and tell me what you’ll be wearing to the event!! I’ll pick 2 winners at random. Note: This event is in Pittsburgh, PA, so please do not enter unless you can be in Pittsburgh, PA October 13th. The giveaway will end Monday, October 1st and I will e-mail the winner! 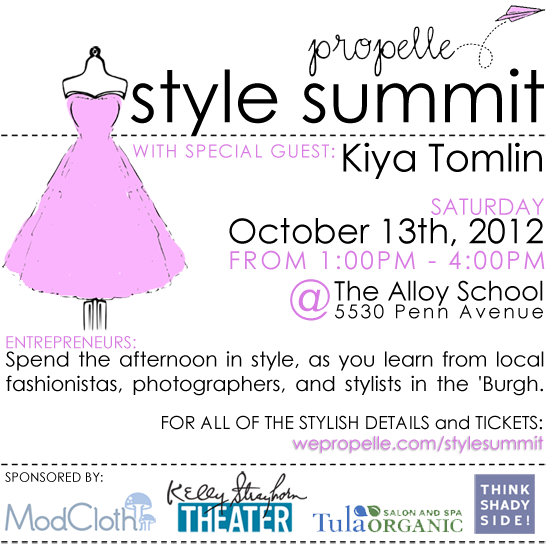 I am excited to announce my part in the 1st annual Propelle Style Summit! It’s going to be a great day, not just because Coach Tomlin’s wife Kiya will be there….but because the day will be packed with lots of awesome speakers and sessions (hair styling, headshots, massage therapy and so much more!) I hope to see you all there! And don’t forget to check out my Tumblr page for ways to win a ticket! I wanted to take a moment and celebrate the 3rd anniversary of my lovely blog here by highlighting some of my favorite moments from the past 3 years. So let’s take a walk down memory lane….will you join me?? Whatever It Takes: Steelers Fans Collections. My Pittsburgh Fashion Magazine Article.